The massive rotator cuff tear is a complex shoulder injury that causes significant pain in the shoulder and limits the functionality of the shoulder. The term massive indicates that at least 2 of the 4 rotator cuff muscles are torn and detached from the humerus. Usually, the massive rotator cuff tear occurs after a traumatic injury or fall on the shoulder. In older people, though, this exhausting shoulder condition occurs slowly over time as a result of the aging process. Surgery is the most recommended treatment, typically in patients who suffer massive rotator cuff tear after a severe fall or injury. However, the massive rotator cuff can be also treated with physical therapy, but in this scenario, the recovery period can be longer than expected. When Luigi Uccello visited Manhattan Orthopedic Care, he was not aware of the complexity of his rotator cuff tear. 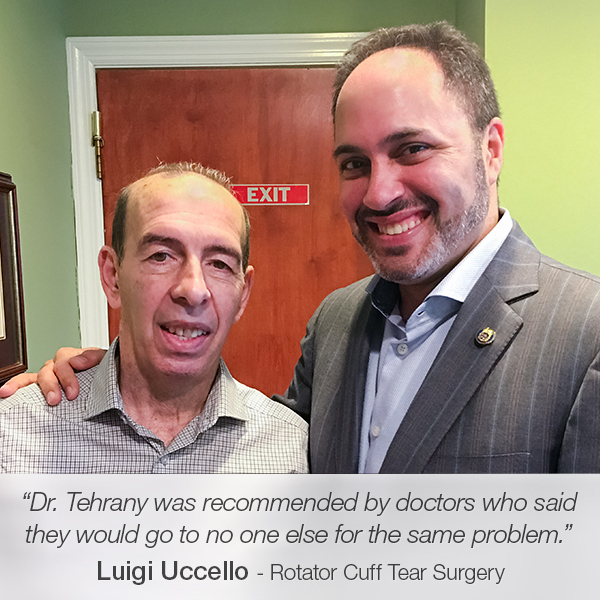 Shortly after he met Dr. Armin Tehrany, one of the best shoulder doctors with a remarkable experience in rotator cuff tear treatment, Luigi felt assured that he was at the right doctor’s office. As a caring medical professional who perfectly understands how stressful the surgical experiences can be, Dr. Tehrany patiently explained the steps and the details of Luigi’s treatment, from the preparation phase, through the complete surgical process, to the post-op activities and recovery period. Dr. Tehrany’s commitment to Luigi’s well-being was beyond his expectations. Impressed by the superb care he was given and the friendly compassion he was shown, Luigi wrote a genuine review on Yelp and shared with the world the exuberance of feeling healthy once again. “A torn rotator cuff led me to Dr. Tehrany. He came highly recommended by other doctors who told me they themselves would go to no one else if they had the same problem. Not knowing what to expect, I was quickly impressed with his knowledge, compassion and bedside manner. Dr. Tehrany took the time to explain every aspect of the surgery, in addition to short-term and long-term recovery. Immediately, I was put at ease. Pre and post-op, I was equally impressed with his surgical staff. Each and every one of them took the time to explain their role in the operation.